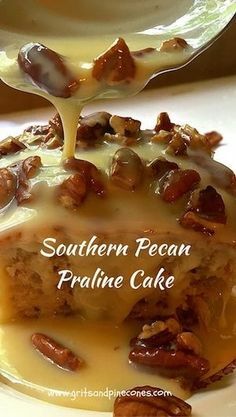 Southern Pecan Praline Cake is about as southern as you can get and if you like pecans and pralines you will love this easy to make, decadent and delicious cake. Preheat the oven to 350 degrees F. and spray a 9x13 baking dish with non-stick baking spray. Place the cake mix, coconut frosting, eggs, oil and water in a large mixing bowl. Use a hand held or your stand mixer and mix well to combine everything. Add the pecans and mix again. Pour the batter into the prepared baking pan. Bake for 40 minutes or until the top is golden brown and the cake pulls away from the sides. Set aside to cool on a wire cooling rack. 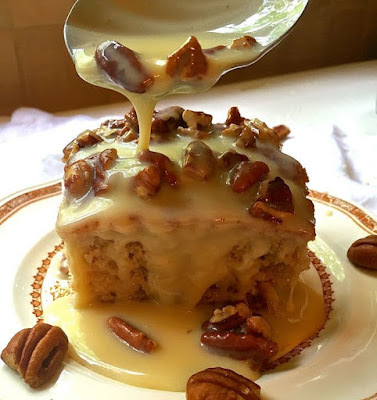 To make the praline topping, combine the butter and sweetened condensed milk in a small saucepan and stir until the butter is melted. Add the pecans and mix well. Pour over the cooled cake and serve. Southern Pecan Praline Cake keeps well covered in the fridge for approximately one week, or you can wrap it well in foil and store in a large ziplock bag in your freezer for up to two months. *To roast pecans, spread them out in a single layer on a baking sheet and roast in a 350-degree oven for 10 minutes. 0 Response to "SOUTHERN PECAN PRALINE CAKE"